One of the most legendary investors of the past century has been George Soros. He turned his hedge fund into a money making machine by which he has not only been making billions of dollars, but he helped provide funding to needy people around the world. In 2011 he retired from running the Quantum Group of Funds and started paying more attention to his philanthropic activities. George Soros was born in Budapest, Hungary on the 12th of August, 1930. His family background was Jewish and he was forced to hide his identity during World War II when Nazis ruled Hungary. He was only 13 years old when his country was occupied by the Nazis. A really bad period in his life had just started. He lived in constant fear for his, and his family’s lives. Fortunately, he managed to flee to England in 1947 and escape from communism and repressions. Initially, he worked as a railway porter for some time. Then he became a waiter at a restaurant. The last job outside finance he got was as a seller at a souvenir shop. He finally realized that such kind of jobs was not what he wanted to do for life. So, he wrote to every investment bank and financial institution he could find, asking for a job. He got just a few replies, one of which was from Singer & Friedlander investment bank. This is how he got his first financial job, which was a helping accountant there. Every day he had to make sure that the balance sheet of the company was OK, and many times numbers just didn’t add up. This made his boss not really happy about that. In 1952 he graduated from the London School of Economics, where he studied anti-communist philosopher Karl Popper. Popper’s philosophy had a deep impact on the further development of Soros. Popper taught the difference between an “open” and “closed” society. Soros gravitated to the more universal open society. Over time Soros developed his own premises about building societies. Later he would name his philanthropic foundation ‘Open Society Institute’ in honor of the ‘The Open Society and Its Enemies’ work of Karl Popper. Several years later Soros moved to New York to become a trader and financial analyst. This happened in 1956. Over the next fourteen years, he would work in different financial institutions, when finally a big change in his life was going to happen. In 1969 he founded an investment firm and named it Soros Fund Management, which became the key to growing his fortune. But the real money making part of his arsenal would become present three years later. In 1973 the ‘Quantum Fund’ was born. It was founded by ‘Soros Fund Management’ in partnership with the not so famous investor in that time – Jim Rogers. Soros worked in finance so that he could eventually finance his interests in writing and philosophy. He was working on a social theory called “Reflexivity theory” which was a tool for predicting and explaining market behavior such as financial bubbles. The main concepts of this work are very well explained in his book ‘The Alchemy of Finance’, which was written in the early 90s and became a commonly read book among finance students. I have read that book, and there are some amazing ideas in it. One of them is that markets are always in disequilibrium, which is the opposite of what the classic economy theory teaches. These ideas and conceptions about markets helped him to become one of the richest people in the world. In 1992, Soros became known as ‘The man who broke the Bank of England‘ by speculating against the Pound sterling, which made him a billionaire overnight. He managed to correctly predict, that England would not be able to stay in the ERM (European Exchange Rate Mechanism), which main purpose was to achieve monetary stability and reduce exchange rates variability in Europe, by fixing all European currencies to the newly developed instrument – ECU (European Currency Unit). Due to increasing inflation pressure, the British pound began devaluing, and The Bank Of England announced, that they would buy unlimited amounts of pounds to stop the depreciation and keep the fixed rate between its currency and the ECU. Soros knew, that this was impossible and started selling heavily the pound against other currencies. And when the reserves of BOE were depleted (as predicted) and the pound couldn’t be supported anymore, the latter simply started falling freely. 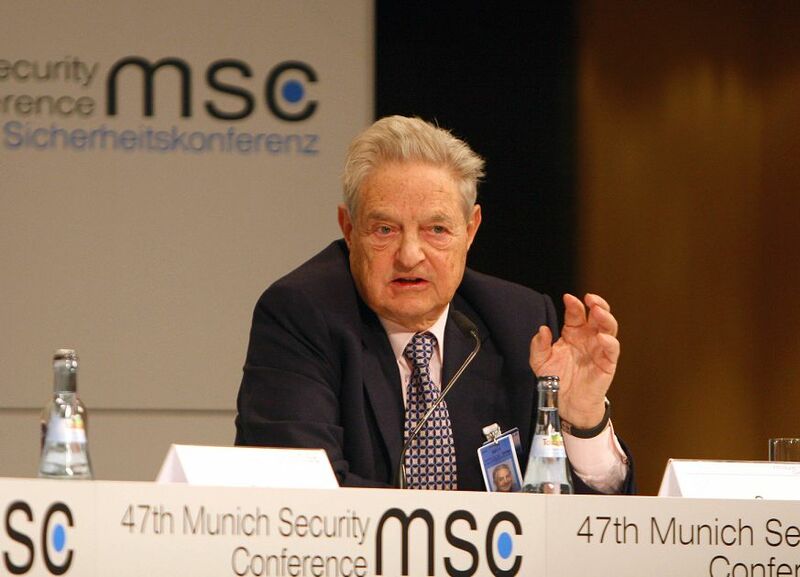 At that time the size of the positions of George Soros and his partners had reached 10 billion dollars. This huge bet made them more than $2 billion in profits. Soros began his ventures into philanthropy in 1979, providing funding to black students at the University of Cape Town in South Africa. In the next five years, he established a foundation in Hungary to promote education and culture. The more Soros became successful at investing, the more he expanded his interests in philanthropy. In 1986 Soros launched an Open Society Foundation in China that was shut down three years later. The center re-opened in the early 2000s, spreading awareness about HIV and AIDS programs. During the collapse of the Soviet Union, he poured money into helping people establish new societies. In 1991 he established the Central European University in Budapest. Then in 1992, he launched the Open Society Institute as the flagship headquarters in New York City for Soros foundations with the intent of expanding the network around the world. At this time he established a relationship with Bill and Hilary Clinton. Soros was recruited as an adviser on U.S. trade with Russia by State Department official Strobe Talbott. By 1995 Soros claimed to have great access to the Clinton team. In 1993 the Open Society Foundations helped provide disaster relief to Sarajevo while it was under attack. In 1995 Soros’ network provided funding to build low-cost housing in South Africa for over three million people. Some foundations have come under government attack, as Soros foundations were shut down in Belarus in 1997 and Uzbekistan in 2004. Government investigations became part of the George Soros story in the late nineties when he had to testify before the House Banking Committee, in which he admitted to financial gains through insider trading. In 2002 Soros was convicted in France of insider trading. In 2011 Forbes estimated Soros’ wealth at $14.5 billion. As of September 2012, Forbes lists Soros’ net worth at $19 billion. He was ranked #15 on the Forbes 400 list and #12 in the United States. Soros resides in Katonah, New York. He has written 8 books about economic and global issues. He has provided over $8 billion in funding to 70 countries to promote education and social causes. In 2010 the Open Society Foundations contributed millions of dollars in disaster relief to flood victims in Pakistan and to earthquake victims in Haiti. Soros is perhaps most recognized for his progressive stance on human rights. In the world of politics, Soros is known to support left-leaning candidates such as President Barack Obama and other Democrats such as John Kerry, Al Gore, Bill Clinton, Charles Rangel, Al Franken, Harry Reed and Barbara Boxer. Soros has been funding political causes in various countries since the mid-eighties. In recent elections, Soros has concentrated on helping Super PACs raise money for Democratic candidates.